There’s a fungus among us–and this is a good thing. With winter approaching, the earth is releasing a splendiferous spread of edible roots and shoots and ground zero may well be Mendocino County. Here, where the Redwood forests thrive on the moist, salty air, mushrooms spring from the nutrient rich soil. With each gentle rain, the tender young caps push up from the ground and beckon to be browned in white wine and garlic. On a dew-kissed morning, we board the Skunk Train and journey deep into the Redwoods for an all-day mushroom symposium. The smell of grilled Portobellos is enough to lure fairies from their forest hideaways. Charmoon Richardson is the chef, whose name came to him during a childhood “epiphany” under a tree. He’s here with other “shroomies” like Eric Schramm, whose company Mendocino Mushrooms sells 50,000 pounds of wild mushrooms a year. One by one, they step up to the microphone, sharing secrets and tips and fantastical tales. Soon it’s time to test our skills, with a good old fashioned mushroom hunt–a foray for fungus that has us scouring the woods for tender young caps and shoots. Identification can be tricky, but there are enough experts here to tell a Crimini from a Candy Cap. We search under tree stumps and leafy debris and call out when we find a mushroom colony. It’s the ultimate treasure hunt and it takes nothing more than a set of sharp eyes. For some, food is art. Local photographer Taylor Lockwood uses these botanical beauties as subjects for his world renowned pictures. Others make paper from the mushroom’s weighty stock. 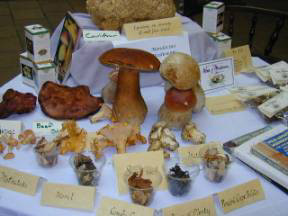 All these art forms are discussed and displayed during the Mendocino Wine and Mushroom Fest. If you’ve found, as I have, that you’re mad about mushrooms–the festival helps you here, too. You’re invited to take home your own growing kit. This way you’ve got wine and mushrooms in the cellar, ready for your next gourmet meal.